Years ago the Mighty Chalkdust told us through kaiso “White people laughing at we” when we mindlessly ape the dress, mannerisms and institutions left behind when colonial rule supposedly retreated. Perhaps he should re-release that song with a “special verse” on the way the two major ethnic groups use the same racist slurs and stereotypes against each other that the colonisers applied to both African and Indian people. called for more, not less, “race talk”. We’ve avoided those conversations for far too long. They’ll be uncomfortable and heated yes, but they’re necessary. So let’s have properly informed talks about race and inject into those conversations the close relationships between Indians and Africans IN India going back thousands of years. India’s former Prime Minister Manmohan Singh had no problem speaking openly about it so we shouldn’t either. Long before even the Arab slaving operations in the Indian Ocean contributed in their own perverse way, there were migrations from Ethiopia and the Sudan. Listen to African and Indian classical music; note the similarities. Let’s point out that as far back as the 1950s UNESCO had a document on race confirming that “race” was just a social construct that had no scientific backing. Then let’s talk about how despite that fact that “race” was just a social construct, it was being used to identify inferior Others so as to “prove” the superiority of Britain – and other Europeans/Euro-Americans. Let’s talk about how this concept of race ran so deep that the British and the Americans not only considered Africans, Indians and Chinese to be shiftless, slothful, liars and heathens, but felt that same way about one another as well as other Europeans. Let’s have race talks that remember the historic march by NJAC to Caroni in 1970. Although NJAC clearly had their shortcomings, let’s remember that what they attempted should be taken in the context of what Uriah Butler was attempting to do back in the 1930s. Correct me if I am wrong but wasn’t it Butler who reached out and kept reaching out to the Indian sugar workers? Wasn’t he called “Mahatma” by them because he represented for them Mohandas Gandhi? And didn’t Butler establish contact with Gandhi and Nehru and in 1947 called for a nation-wide celebration of India’s independence? Let’s discuss the many attempts to keep poor African and Indian labourers apart from and suspicious of each other in Trinidad by the then business elites along with the US, Canadian and French missionaries who came here. Let’s talk about how since the late 1800s local white creoles were persistently requesting that a warship be stationed in Trinidad. This was requested because in spite of their efforts at segregating, they frequently heard African and Indian drumming merging together during Hosay celebrations in St James and other places…to their terror. Let’s have frank discussions as to how and why Presbyterian schools and churches are today predominantly Indian despite the fact that in the late 19th century many early parishioners and teachers were Afri-Creoles. All this has been documented by researchers like Dennison Moore in his book “The Origin and Development of Racial Ideology in Trinidad” so we don’t have that much hard wuk to do. Let’s talk about how in Western academia a fascination with ancient India grew out of the infamous East India Trading Company’s need to study their subjects and their Indian “allies” who were facilitating their commercial and military expansions into India in their constant search for new markets. Let’s talk how that fascination was twinned with a deep-seated contempt for India and Indians. Like Africa and China before it, India may have been touted as a cradle of civilisation by Western academics, but its very stable traditions and culture were used by them to “prove” its backwardness and decadence, and the unfitness of its people to govern themselves. Lord Harris, Governor of Trinidad from 1846 to 1854 and Madras from 1854 to 1859. They needed the firm guiding hand of white, Christian Europe; this was the basis for deeply racist statements made by Lord Harris, Thomas Macaulay, Winston Churchill and others who today many Afro and Indo-Saxon historians and academics seem bent on defending and touting as models to be emulated. 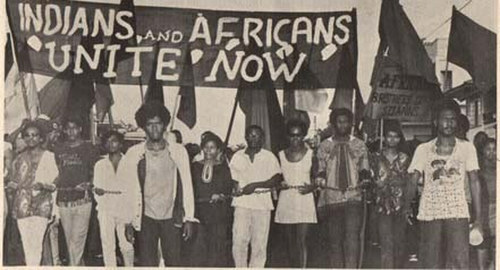 I agree that there is a long and ugly history of Afro/Indo tribalism, some of which has seeped into the calypso fraternity that once was a voice for the grassroots to the power elites. I agree that there must be acknowledgment of the way East Indian culture, dress and people were demeaned and looked down upon by people of African ancestry here in this country since the first indentures arrived. There’s no denying that it was shameful. But put it in proper historical context: who held the power? Who created the environment? Who set the very narrow parameters that anyone – Afro, Indo, Lebanese, Chinese – aspiring to be let into the corridors of power and influence (or so they thought) had to conform to? Who remained extremely powerful even after the flags were superficially switched in 1962? Note that in the same kaiso fraternity we can also find many voices from Lion in the 1930s with “Bargee Pholourie” to Shorty’s “Om Shanti” to Chalkdust’s “Ram Kirpalani” that held up elements of the Indian community to admiration and emulation. Cro-Cro and Aloes are not the sum total of kaiso and bible-waving Christians are not necessarily the sum total of Africentrists. We can’t be going on holding these same toxic ideas of the Other. Who does it benefit now? Answer that question and let’s include those in the talks as well.